Adjust it to people, to the place, to the time and to the medium. Adaptation is an important condition when it comes to build a better future. The Total School adapts to a series of different realities and creates places where it is possible to think of a great future. With André Dalla Nora Fauri, Diego Augusto Gassen Saraiva and Rafael Mansur Bernardes Berny. Adaptar-se às pessoas, ao lugar, ao tempo e ao meio. Adaptação é uma importante condição para a construção do futuro. A Escola Total adapta-se às mais variadas realidades do Brasil, criando ambientes favoráveis para a estruturação do futuro em cada condição. Com André Dalla Nora Fauri, Diego Augusto Gassen Saraiva e Rafael Mansur Bernardes Berny. 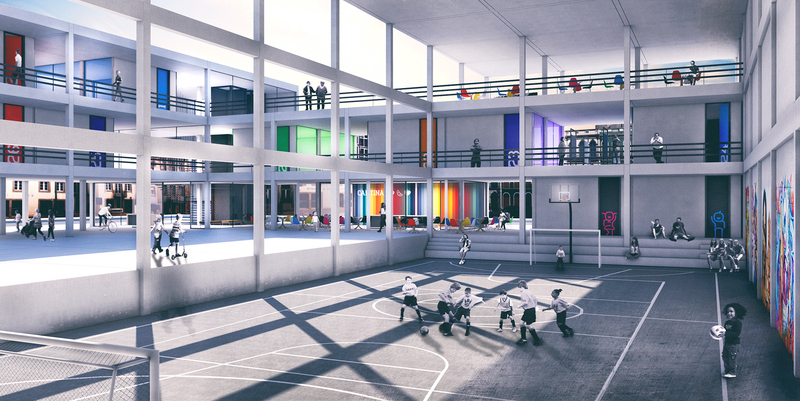 The aim of this competition was to design a prototype of school which could be implemented in every Brazilian city. THE PROGRAM consists of classrooms, sports court, auditorium, foyer, library, laboratories and café. There was no specific site for the proposal. The prototype should be able to fit in any site. As reference, we worked on a 50x40m corner site. The concept is to create a school which could fit perfectly and perform well in any kind of situation. It should be implemented in cities with different populations, in communities with varied cultures, in regions with different natural conditions. 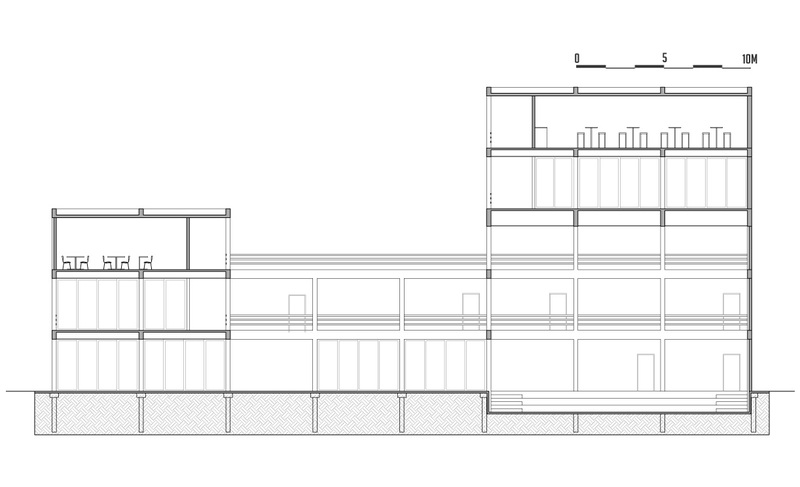 The design starts by recognizing the only characteristic that every site in the city has in common: some perimeter. The perimeter of each site is occupied with modular bars, which are added in a helical movement along it. The bars can be rotated and adapted according to the site. This system allows the school to be implemented in any site. The bars are modulated in a 5x5m grid, which allows the school to be conceived with a simple structure system. The circulation in the school happens through an open gallery, facing the patio. All the program is directly accessed through these galleries. The Total School is organized in two story bars disposed around the patio. 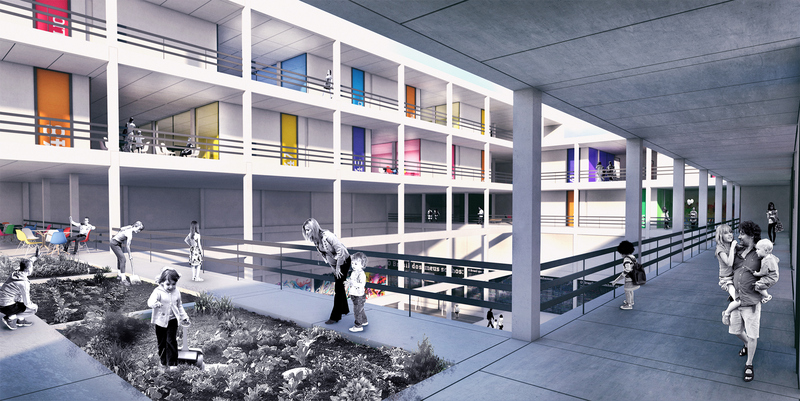 The access to the school is done through the foyer, conceived as an interface between the school and the street. The circulation between floors occurs through two blocks of stairs and elevators. The first one is located near the reception. The second one is located in the opposite vertex. 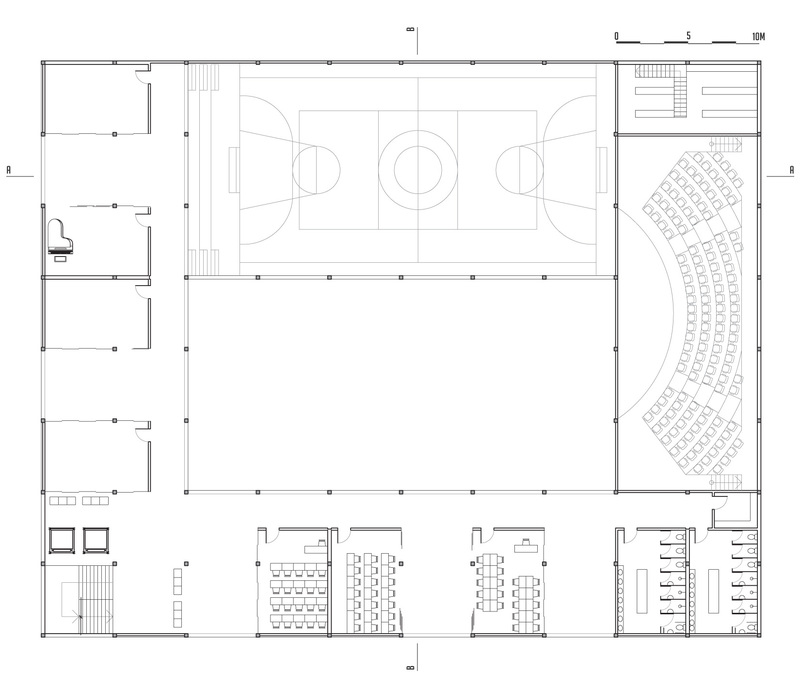 The circulation in the floors occurs through an open gallery, which is facing the patio, ensuring the connection between all the spaces of the school. 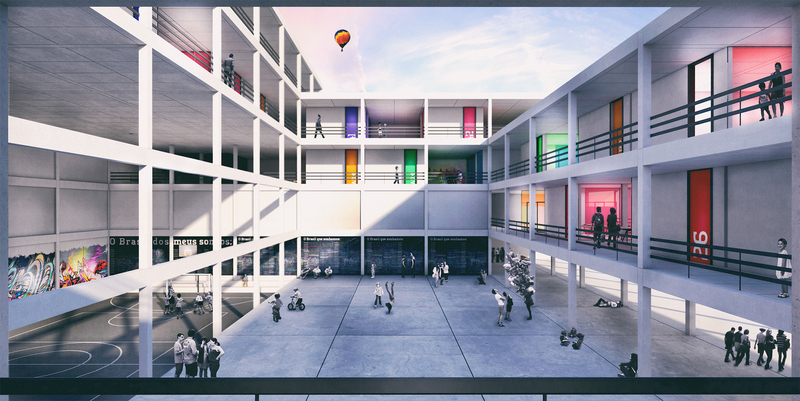 Along the bars, the classrooms take place, being interspersed with multiuse spaces. These multiuse spaces are open, allowing the students and the community to perform activities, such as exhibits and recreational classes. These spaces also improve the illumination and the ventilation of the classrooms. O objetivo desse concurso era projetar um protótipo de escola que pudesse ser implantado em cada cidade do Brasil. 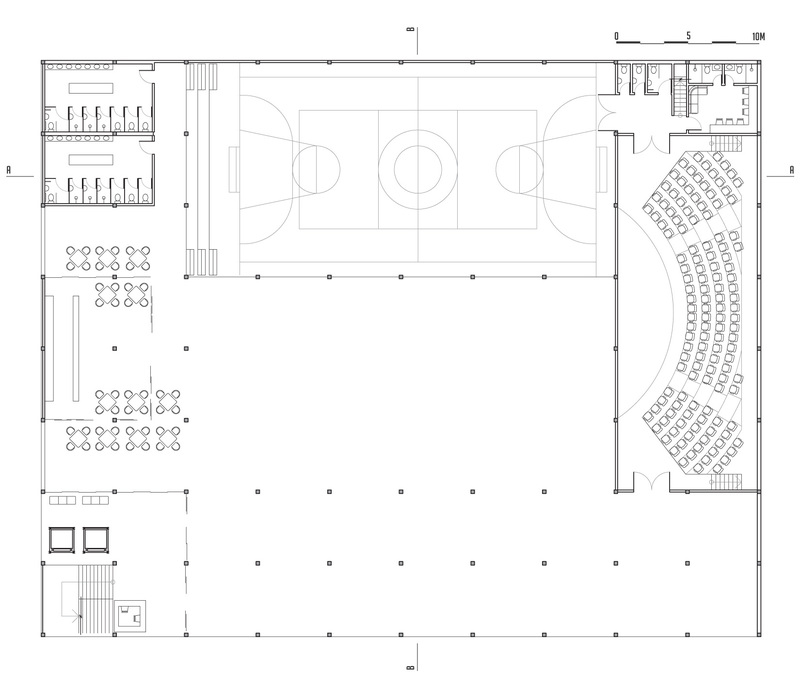 O PROGRAMA consiste de salas de aula, quadra de esportes, auditório, foyer, biblioteca, laboratórios e café. Não havia um terreno específico para o projeto. O protótipo deveria se ajustar em todo terreno possível. Como referência, trabalhamos em um terreno de 50mx40m. O conceito é criar uma escola que possa se ajustar bem e ter boa performance em qualquer tipo de situação. Ela deveria poder ser implementada em cidades com diferentes populações, em comunidades com culturas diversas, em regiões com diferentes condições naturais. O projeto começa reconhecendo a única característica que todo terreno compartilha: um perímetro, uma geometria. O perímetro de cada terreno é ocupado com barras modulares, que vão sendo adicionadas umas as outras em movimento helicoidal. As barras podem ser rotacionadas e adaptadas ao perímetro de cada terreno. As barras são moduladas em um grid de 5x5m, o que permite que a escola seja executada com um sistema estrutural simples. A Escola Total é organizada em barras de dois pavimentos dispostas em torno do pátio. O acesso à escola ocorre pelo foyer, concebido como uma interface entre a escola e a rua. A circulação entre pavimentos ocorre através de dois blocos de escadas e elevadores. O primeiro fica próximo à recepção, e o segundo no vértice oposto. A circulação nos pavimentos é feito através de uma galeria aberta voltada para o pátio. As salas são dispostas ao longo das barras, sendo separadas por espaços multiuso. Esses espaços são abertos à comunidade, e sua existência assegura iluminação natural e ventilação para as salas.